Flanked by the historic Tower of London on one side and the even more iconic Tower Bridge on the other, the Perkin Reveller seems to have all the makings of a prime riverside tourist trap. Only, it’s not. In fact, once you’ve gotten over the spectacular views and taken in the options on their seasonal, contemporary British menu, you start to realise that it’s all actually rather good by tourist-ville standards. Taking its unusual ye-old-world name from Chaucer’s Canterbury Tales (the ‘Perkin Reveller’ was a fictional foodie and chef from the Middle Ages), this spacious all-day dining venue is housed in a minimalist wooden structure just beside the Tower of London’s East Gate. Long, banquet style wooden tables line the river-facing aspect of the hall with tables for smaller groups towards the back of the restaurant. 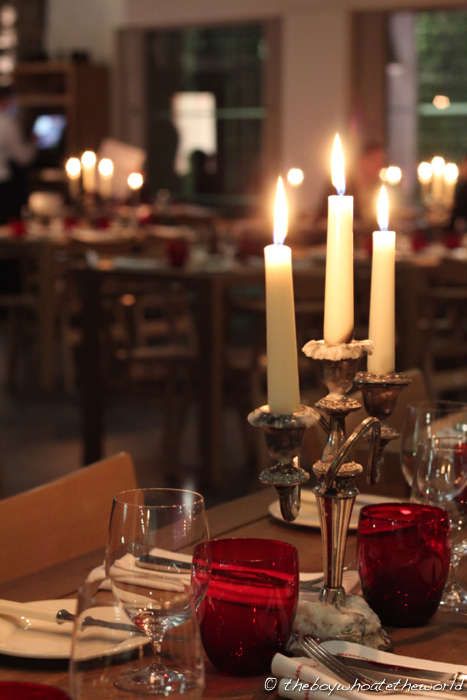 Dine here by night as we did and every table will be lit by vintage candlesticks, giving the place an almost ethereal feel. Their chic cocktail and gin bar next to the restaurant is particularly worth a mention. Featuring original stone pillars and a bar top hand-crafted from an antique church pulpit, it was buzzing with Londoners looking to let their hair down on a Friday night. What’s more, there’s also a large outdoor terrace area, empty for now given the extended winter we’re plodding through, but one that will undoubtedly be packed to the rafters come the summer months. We started off with a portion of devilled whitebait to pick at. 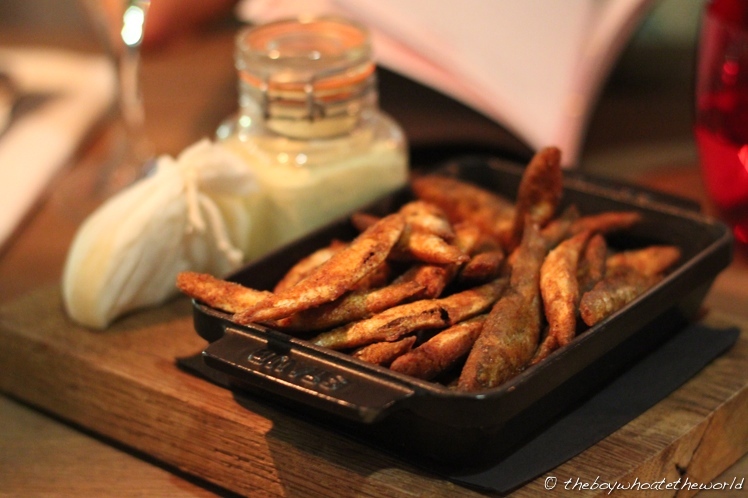 Deep-fried in a light batter spiked with plenty of cayenne and paprika, the whitebait was crisp, meaty and delicious, especially when dipped into the aioli on the side. What I loved most of all was the attention to detail in the plating – everything from the mini re-clippable glass jar to the rustic cast iron serving tray succeeded in lifting this simple bar snack into something just that little bit more special. Onto the main courses. Slow-cooked pork belly was tender and sumptuous, going well with the rich, black pudding mash. 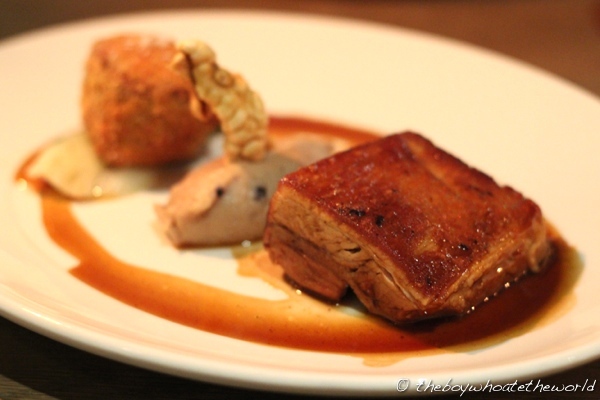 What I enjoyed even more than the pork belly though was the crispy croquette on the side. Crunchy on the outside, with fragrant, melt-in-the-mouth chunks of well-seasoned piggyness inside, it was a joyful few bites to chomp down. 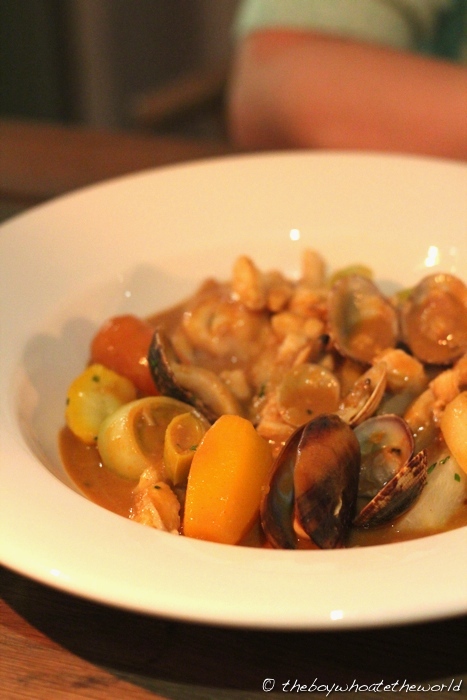 Cornish fish stew, served with turned saffron-flavoured potatoes and baby vegetables was a British take on the classic Bouillabaisse. The fish-stock and saffron based gravy was thicker and creamier than the version you would normally find on the other side of the channel. Although the flavours were nicely balanced, I thought the sauce lacked body towards the end of each mouthful. Also, at £18.50 a pop, I would have liked to have seen a tad more fish meat. There was no shortage of clams and mussels on the plate… but once you took the shells off however, the dish started to look a little bit lacking portion-size wise. 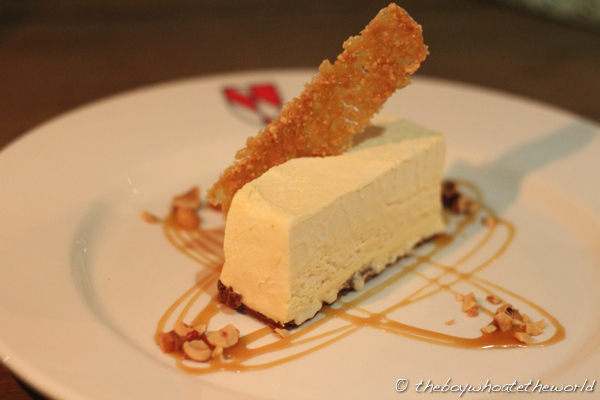 Caramel parfait, spiked with sea salt and topped off with a crispy tuile brought the curtains down on our meal. The parfait was creamy yet air-light, the texture almost duvet-esque as you sunk your fork into it. It’s a salted caramel dream on a cloud and a simple, understated yet brilliant dessert. Considering your only other options nearby are the mass-produced high street sorts, the Perkin Reveller is easily the best thing that has popped up in Tower Hill’s tourist centric dining scene of late. Sure, there’s nothing ground breaking about the simple gastropub style food. On the whole though, the fresh, seasonal and well-executed British cuisine here is hard to fault and fully deserving of their recently awarded 2 AA rosettes. Plus, the prices here are actually fairly reasonable taking into account the splendid views and historical context of where you are dining. Chaucer himself would have revelled here. Great post! Might have to pop in here next time we’re London way. @acrusteaten: Thanks, such a pleasant surprise to have a decent restaurant in an area normally dominated by mass-produced tourist traps!